The future of America’s rebalance to the Asia–Pacific continues to be a topic of much discussion and speculation. There’s no doubt that the rebalance has steadily continued over the past few years—albeit with less fanfare than many thought would be the case at the end of 2011. And yes, Ash Carter appears well credentialed and well respected; his first international jaunt as Secretary of Defense showed that he’s motivated and looking in the right direction. But while senior leadership is important to reassure allies and reorient the American consciousness, it’s only one way to contribute to regional stability—a central objective of the rebalance. Another way comes from beyond the US and is found in America’s allies and partners networked across the Asia–Pacific. For a number of years, China’s been pushing the boundaries—hoping to push its boundaries—in a very nineteenth-century fashion. 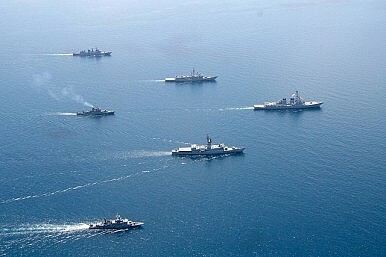 Unilaterally declaring an Air Defence Identification Zone over a large section of the East China Sea, placing a state-owned oil rig in Vietnam’s exclusive economic zone (EEZ), building a ‘great wall of sand’ through persistent land reclamation efforts (such as those seen on Mischief Reef in the EEZ of the Philippines), and the wholesale rejection of international arbitration to resolve disputes are all developments of concern to some of China’s neighbours. As a consequence, those same neighbours are increasingly seeking solace and safety in numbers. There’s an observable trend toward more bilateral security cooperation within the region, and between Asian countries and the US. In a variety of fora and in various permutations, they’ve released carefully worded statements on the current and future state of the region’s security order. The themes are well known: rule of law and international norms are central, regional prosperity has been borne of regional stability, dispute resolution mechanisms are important, and self-serving actions to change the status quo aren’t received kindly. While the US has been preoccupied seeing to its global responsibilities, it has encouraged its allies and partners in the Asia–Pacific to deepen and broaden cooperation. For the Americans, the request is a way of sharing the security burden. For US allies and partners, it’s an opportunity to buy into a cooperative security position stronger than they could sustain on their own. For Beijing, it’s cooperation that can only increase the effort needed to advance Chinese claims. Where states have a similar reading of the regional security order and see strategic value in closer alignment (be it militarily, diplomatically or economically), they’ll usually act to realize the benefits. In this cooperative environment every strategic partnership entered into, every statement released, every joint endeavor announced and military exercise conducted is at China’s expense. Each is another run on the board for the US-led, rule-of-law-loving order that’s supported regional stability and prosperity for over 60 years. After some fallow periods, the soil is prepared and ready for more rebalancing. The Philippines looks set to gain a new ‘strategic partner’ with and at the behest of Vietnam. It’ll be the third such partnership for the Philippines, with Vietnam joining the ranks alongside the US and Japan. Exercise Balikatan, the war game between the US, the Philippines and Australia currently underway in the South China Sea, is reportedly the largest iteration in 15 years. For Australia’s part, the alliance with the US is primed and ready, and our relations with Japan continue to deepen (with some going so far as to claim an Australia–Japan ‘quasi-alliance’). Even the historically ‘non-aligned’ sense a need for change, with India’s Narendra Modi hugging for security as China subtly agitates on land and at sea, and as Pakistan becomes an increasingly important Chinese partner. Like all policy, America’s rebalance is intended to advance its national interests. It makes sense for Washington to want to maintain primacy in the Asia–Pacific, particularly in the face of Beijing’s destabilizing assertiveness. For that reason and others, America’s regional allies—save for Thailand—are doubling down on their alliances, and its partners are pushing for cozier relations, either intra-regionally or bilaterally with the US. In the absence of strong senior leadership on the rebalance, be it from the White House, the State Department or the Pentagon, Asia–Pacific powers are doin’ it for themselves. Those deeper relations are potentially costly to China, which carries on seemingly unconcerned that their every action to unilaterally alter the status quo is having an equal and opposite reaction. David Lang is an analyst at the Australian Strategic Policy Institute. This piece was originally published here.